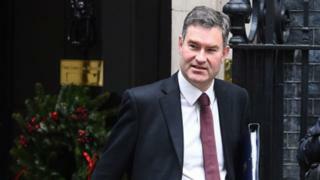 Justice Secretary David Gauke has said he would be “very surprised” if the prime minister was prepared to back a no-deal Brexit, if her deal fails. Mr Gauke also said he would find it “very difficult” to stay in cabinet, if that became government policy. Cabinet splits have emerged over what should happen if the PM’s withdrawal deal is rejected by MPs next month. Andrea Leadsom has suggested a “managed no deal” Brexit while Amber Rudd said a new referendum was “plausible”. Mr Gauke supported Remain in the 2016 referendum. The Commons vote was due to be held earlier this month but Theresa May postponed it, once it became clear it would be defeated by a large margin. MPs are due to start debating the deal again on Wednesday 9 January. Mr Gauke, who was interviewed on the BBC’s Political Thinking with Nick Robinson podcast, was asked about comments he reportedly made at a cabinet meeting on Tuesday, in which he dismissed the idea of a “managed no deal” Brexit as a “unicorn”. He said there was a risk of an “accidental no deal” and that “the best way of stopping no deal is to back the prime minister’s deal, in my view”.